Denser than a dumptruck full of dwarf-star matter and exerting more crushing gravity than a supermassive black hole, instrumentalists Omega Massif have returned with a follow-up to their hulking debut album Geisterstadt and it’s another bruising beast of a record. 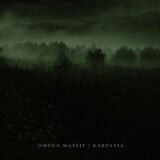 Taking the musical blueprint from their debut and distilling it down over a two year period of songwriting, Karpatia makes all the moves that one would expect from Omega Massif, but does them more so. Everything has moved up a notch since Geisterstadt – the heaviness is heavier, the sound is thicker, the highs are higher, the lows lower, and the contrast between quiet and loud, heavy and soft is so much more dynamic. Omega Massif have their game-face well and truly ON. Wasting no time on elaborate intros, Omega Massif plough straight into brooding opener ‘Aura’ with enough force to knock a man off of his feet. Menacing and glowering, a low-slung prowling bassline and tribal battering thump away below chiming, tolling guitars that suddenly give way to a steamrollering riff and a scything, rolling chug that flatten all in its path. Soon enough, the rhythm drops out into monstrous hanging chords and ringing single-notes that recede into subdued strumming and distant-sounding harmonies. Such tranquillity cannot last, however, and the guitars soon turn nasty again, building in menace and swelling into a maelstrom, driven by pounding drums and growing more forceful until the wave of sound breaks against the dam and the track is over. Second track ‘Wolfe’ centres around a choppy, rolling gallop with a vicious edge that slips into a staccato rhythm so sharp it could cut your throat. Throw in a massive, hulking crust-style riff and we’re away. Lethal. ‘Ursus Arctos’ opens with majestic, towering chords like blocks of primal granite juxtaposed against brittle, spidery guitars before lurching into a riff so menacing and glowering that it’ll have you checking over your shoulder whilst listening, just in case some monstrous behemoth has lumbered in behind you unbeknownst and is glaring daggers at the back of your head, ‘Im Karst’ possesses a kind of stateliness and grace somewhat reminiscent of seeing the biggest iceberg you could imagine float by whilst standing on the deck of the Titanic and thanking your lucky stars for the near miss, blissfully unaware of what lies ahead, and title track ‘Karpatia’ is simply colossal, utterly majestic and quite terrifying – a haunting, ghostly thrumming drone and a rhythm like the steam-powered infernal machine of a mad scientists dreams. Utterly vast and overwhelming. To try to top it would be folly, so closing track ‘Steinernes Meer’ is somewhat of a gentler, palette-cleansing, affair, being as it is a strident metal-inflected post-rocker, not unlike the statelier latter-day Deftones material, that does the whole whisper-to-a-scream thing as well as Omega Massif can manage…which is very well indeed, thank you very much. Masters of their craft, Karpatia sees Omega Massif at the very peak of their game, looking down from on high at all of the weakling pretenders to the throne that crowd around the base of their lofty keep, safe in the knowledge that NO-ONE is going to bring them down from their perch.